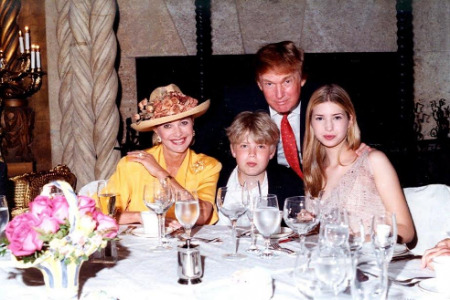 Donald Trump's ex-wife Ivana Trump has revealed that the Billionaire business man and U.S presidential candidate didn't really care about raising his kids - Ivanka, Eric and Donald Jr. until he was able to discuss business with them. Her revelations came about when party-goers at the Lifeline benefit at Le Cirque on Wednesday complimented her on how poised her kids have appeared while supporting their father’s presidential campaign. “Donald wasn’t really interested in the children until he could talk business with them,” the 67-year-old NYDailyNews. Ivana also revealed she regularly speaks to her ex and has even offered him campaign advice and that she's happy she won't be moving into D.C with him if he wins the presidential elections. I’m happy I’m not going to the White House — Washington freaks me out, I can do the speeches, I can kiss the babies, I can do the charities,” Ivana said. But Ivana feels Trump's current wife Melania Trump won't be happy fulfilling First Lady duties.